If Geek Squad is a nursery school for MSPs, its founder Robert Stephens, is the headmaster. Stephens has moved on from the iconic IT services company he started after dropping out of college in 1994. He’s also moved on from the CTO role he assumed at Best Buy, years after selling his once one-man-and-a-bicycle business to the company that would make it the keystone of a more than $3 billion services business. But he’s still in the game, and one of its most colorful players. Stephens is co-founder of the chatbot startup Assist, a company that’s bridging text and voice technologies to enable cutting-edge digital customer service for some high-end, tier-one retail and consumer brands. I sat down with Stephens in Phoenix last week at the SolarWinds Empower user conference. Among many interesting points in our conversation were exchanges about IT Services marketing and pricing. When Stephens launched Geek Squad on the heels of his first business attempt—a bicycle-driven, single-man IT service shop called Techno Medic that lasted about three months—he knew more than anything else that he had to get noticed. He didn’t have a marketing budget, so he had to get creative. It was his early success with some very creative marketing that instilled an anti-big-budget-marketing mentality that he carries to this day. Stephens, still a “solopreneur” at the time, knew he wanted to attract affluent clients. He surmised that they hung out at the opera. 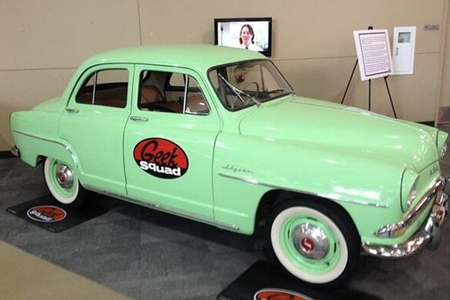 So he trolled the opera house in a light-teal colored, 1958 Simca Aronde emblazoned with the Geek Squad logo on its doors. To make sure he was noticed, he let enough air out of the car’s fat, white sidewall tires to ensure they’d let out a little squeal on the pavement as he turned slow laps around the block.